Eltronicschool. - One purpose of main failure alert circuit designed is to protect a stock and equipment from damage. This device will give you information from the alerting when something problem and protect the electricity fail. 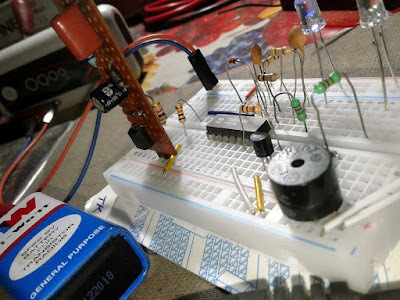 Although there are many main power power sold in the market but you also can make it easily using simple electronic circuit like in Figure 1 below. You only using main component CMOS IC CD4060BE to build this circuit. Circuit schematic like shown in Figure 1 above is Circuit Schematic Mains Power Failure Alert Based on CMOS IC CD4060BE. Accordingly of Electroschematics site describe that the core component of the design given here is one revered 14-stage ripple-carry binary counter/divider and oscillator CMOS IC — CD4060BE (IC1). As shown in the schematic, components R3 and C2 set the clock frequency of IC1 close to 10 Hz, and there’s a blue indicator (LED1) to show the clock activity. The Q4 output (Pin 7) of IC1 drives an active piezo-buzzer (PZB1) and a red indicator (LED2) through a small NPN transistor S8050 (T1). The circuit also includes a standard, on-rechargeable, 6F22 9-V battery (BAT) in power supply and a low-voltage slide switch (S1) as the master power on/off switch. The front end of the design is a simple AC230V mains presence sensor built around one popular photocoupler PC817B (OC1). The output of OC1 is routed to the “master-reset” terminal (Pin 12) of IC1 to disable its clock operation when the AC mains supply is available (standby mode). There are so many ways to convert an AC voltage into a DC voltage required by a photocoupler, and traditionally, this has been done with a step-down transformer. However, a low-cost alternative — capacitive power supply — is employed here because it’s more cost-effective and significantly smaller. In the AC mains presence sensor, a 100-n/250-V AC capacitor (C5) is the key element, and the 100-Ω resistor (R3) is to limit inrush current. The remaining components include a rectifier (D2), buffer (C4), and a protector (ZD1). The 5.1-V Zener diode (ZD1) is added intentionally to deter the blowup of C4 in case of an open-load condition at the output of the capacitive power supply (all resistors are ¼-W type). Eltronicschool. - Do you want to take the latest version of Proteus simulation software in this time in 2019? Yes you can use the latest version of this software with Proteus 8.8 SP1 Full With Crack and Installation Instruction for Windows to take create electronic simulation and PCB layout design. In this time, we will give you global description about Proteus software, and then we will give you link to take free download Proteus 8.8 SP1 Full With Crack and Installation Instruction for Windows from external server now. This is Proteus 8.8 SP1 Full With Crack and Installation Instruction for Windows for you who want to create simulation with ISIS and PCB layout design with ARES. 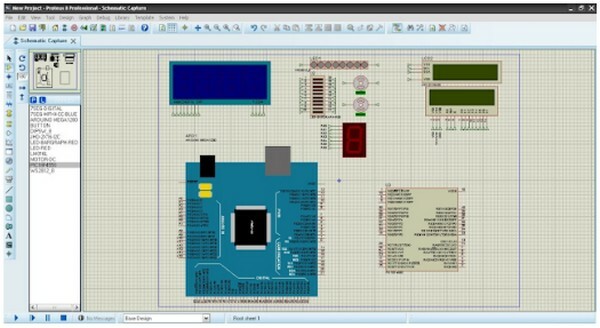 Accordingly of Mazterize site describe that Proteus is a powerful Computer Aided Design (CAD) software that was especially designed to help designers build and verify the circuit boards easily. By using this software you can create a highly complex electrical circuit designs requires not only solid knowledge, but also a set of tools to get the job done. Proteus PCB Design enables you to design a PCB which there are very detailed electrical components such as microcontrollers, microprocessors, and other components are often used in electrical circuits. Proteus Professional provides an interactive simulations and customizations tools that enables designers to view and edit the properties of every element on the board. It help you design, test and layout professional PCBs like never before. The design can be edited, simulated, verified, as well as exported. Proteus Design Suite delivers the complete software package for today and tomorrow’s engineers with VSM simulation and new flowchart engine that provide a truly integrated and intuitive development environment. That’s all, just never update, block by a firewall! And now you can click the link below to take free download Proteus 8.8 SP1 Full With Crack for Windows from external server easily. Eltronicschool. - There are many aplication of using ultrasonic proximity detector as like when you want to build an automatic flush toilet for your home or design a machine to taunt your cat every time you walks by. In here we will show you one project on how to build by your self circuit schematic ultrasonic proximity detector based on LM393 IC look like shown in Figure 1 and Figure 2 below. There two main part of this project called with transmitter and reciever. You need ultrasonic sensor as transmitter and also as reciever. The main IC used in this project is using LM393 IC. Beside we will give you all of the circuit schematic, we also will give you more description on how to build this project and continued to see more from original site. Circuit schematic like in Figure 1 and Figure 2 above are the transmitter and reciever of ultrasonic proximity detector based on LM393 IC. 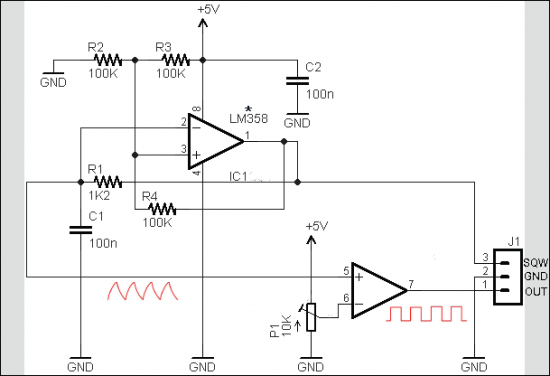 The main component in these circuit are ultrasonic sensors and detector and also IC LM393 IC. 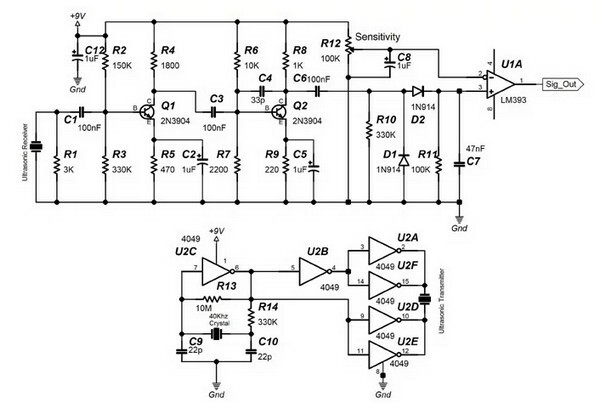 Accordingly Jameco site describe that This circuit schematic has a maximum detection range of approximately 6 feet. When someone passes in front of the ultrasonic transceiver board, the contacts of relay K1 will close. The relay will remain energized while the device continues to detect a reflection. When there is no reflection, the relay contacts will open after 20 seconds. Photo 1 shows the assembled circuit on an experimenter's breadboard. And now you can follow step-by-step on how to build this project using link HERE. Eltronicschool. 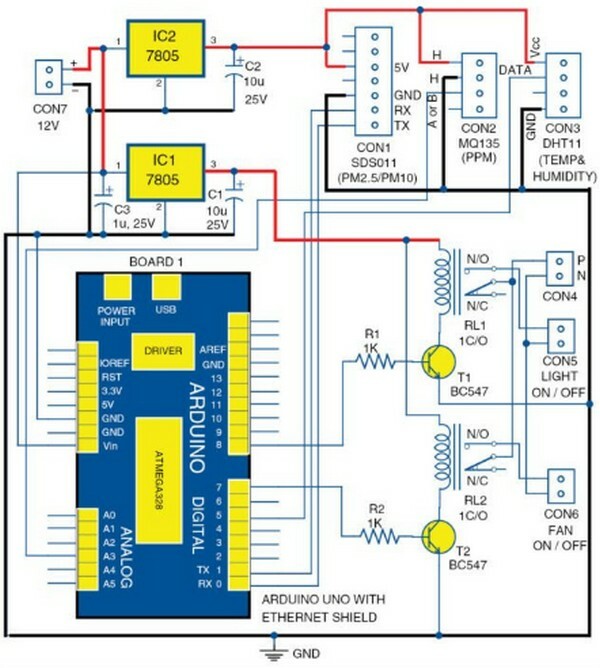 - Do you need circuit schematic to control your small dc motor now. We recommend you to use this circuit schematic that can control dc small motor as used in recorder tape. This is Soft Button Type Motor Direction Controller using Transistors circuit schematic. The main component used in this circuit are transistors PNP and also NPN types. So, please follow all circuit and components used look like in Figure 1 below. Circuit schematic like in Figure 1 above is Soft Button Type Motor Direction Controller using Transistors. Based on Electronics Zone site describe that When both the points A & B are “HIGH” Q1 and Q2 are in saturation. Hence the bases of Q3 to Q6 are grounded. Hence Q3,Q5 are OFF and Q4,Q6 are ON . The voltages at both the motor terminals is the same and hence the motor is OFF. Similarly when both A and B are “LOW” the motor is OFF. When A is HIGH and B is LOW, Q1 saturates ,Q2 is OFF. The bases of Q3 and Q4 are grounded and that of Q4 and Q5 are HIGH. Hence Q4 and Q5 conduct making the right terminal of the motor more positive than the left and the motor is ON. When A is LOW and B is HIGH ,the left terminal of the motor is more positive than the right and the motor rotates in the reverse direction. I could have used only the SL/SK100s ,but the ones I used had a very low hFE ~70 and they would enter the active region for 3V(2.9V was what I got from the computer for a HIGH),so I had to use the BC148s . You can ditch the BC148 if you have a SL/SK100 with a decent value of hFE ( like 150).The diodes protect the transistors from surge produced due to the sudden reversal of the motor. Eltronicschool. - This is one of project to build breathing LED sleep indicator using LM358 look like shown in Figure 1. The main component in this project is used LM358 IC. In this project will show you as replica of the iconic breathing pattern used for the “sleep” indicator in Apple computers. But in this design only using popular analog component although it will help using microcontroller to build pulse-wide modulation. In this project we will give beside circuit schematic, we also will give you component are needed and also global description. Circuit schematic look like shown in Figure 1 above is breathing LED sleep indicator using LM358. Electroschematics site describe that the design is centered entirely around one popular dual-operational amplifier LM358 (IC1) to slowly fade a green light-emitting diode (LED1) in a special pattern (the so-called breathing effect). The circuit runs well with a regulated supply voltage of 5 V; higher-level voltages are not recommended. If the two-way jumper (JP1) in the circuit is in “test” mode, the circuit will work as a standalone indicator. But moving the jumper position to “normal” mode, a TTL high-logic signal input is required to enable (EN) the indicator. This option is added deliberately so that we can enable/disable the Sleepy-LED Eye using the existing microcontroller (uC) in a project — just one free I/O port of the concerned uC is needed there. For example, one I/O port of the uC can be programmed to wake-up the Sleepy-LED Eye only when the system is in its standby state. Eltronicschool. - This is oen of the best simple DC dimmer lamp based on IC LM358 look like shown in Figure 1 and Figure 2 below. The main component needed int his circuit is LM358 and MOSFET IRLZ44. 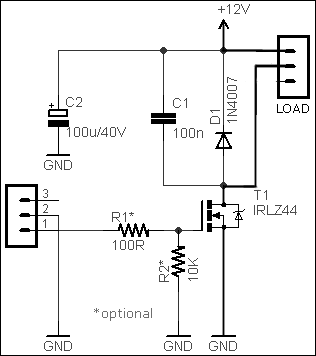 In this time, beside we will give you the circuit schematic of simple DC dimmer lamp using LM358, we also will give you the global description of this circuit came from the original source. According Electroschematics site describe sometimes you want to have specific modules in your lab that are not available off the shelf — a compact DC dimmer/regulator module, for example. That’s why I decided to develop my own module, which consists of just a few standard electronic components. The module can be used as a key element to control the brightness of DC lamps and/or the speed of small DC motors in portable hand tools like your PCB drill. In this basic, op-amp–based, astable design, components R1 and C1 set the operating frequency as the astable operation relies on repeatedly charging and discharging the capacitor from the output of the op amp through the resistor. The other three resistors (R2, R3, and R4) control the minimum and maximum voltage that the capacitor charge comes across during a cycle of oscillation. The output at the capacitor (Pin 2 of IC1) is shaped like a sawtooth wave, but a square wave (SQW) is available from the output (Pin 1 of IC1) of the oscillator. For the given configuration, the frequency is fairly close to 5 kHz. Eltronicschool. 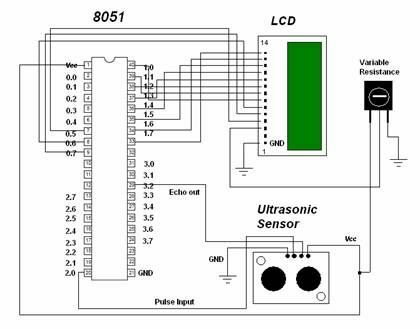 - This is one of the ultrasonic range sensor for detecting object for you in this time to show you one of the circuit schematic of 8051 Microcontroller Based Ultrasonic Object Detection like shown in Figure 1 below. In this project based on ultrasonic sensor module and microcontroller 8051. In this time beside we will show you about the circuit schematic, we also will give you the global description about this project. 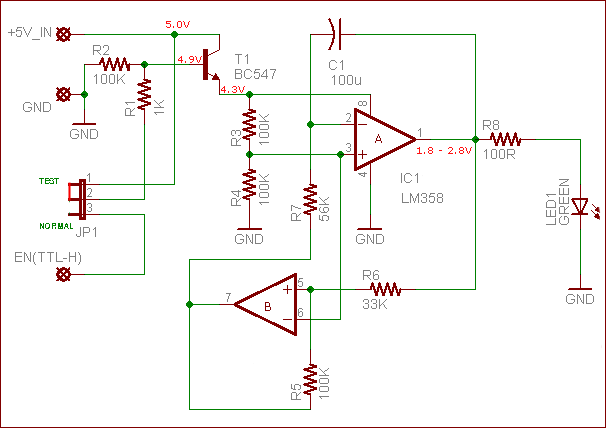 According elprocus site describe that this circuit is designed with an 8051 micro-controller and an ultrasonic sensor. The sensor transmits the ultrasonic sound waves of kHz. When an object or obstacle comes ahead of the sensor, the sound waves are reflected. Then the receiver detects the kHz sound wave. The circuitry converts the sound signals to electrical signals which are fed to the microcontroller interfaced. 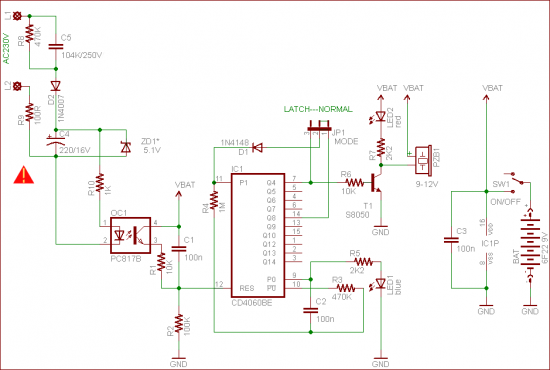 The microcontroller receives the signals and actuates the output to take appropriate action. The LCD interfaced to the microcontroller is used to display the status of the module. This project can be enhanced to calculate the distance of the object and find the location of the object. Eltronicschool. - This is one of project to build voltage sensor using LM714. 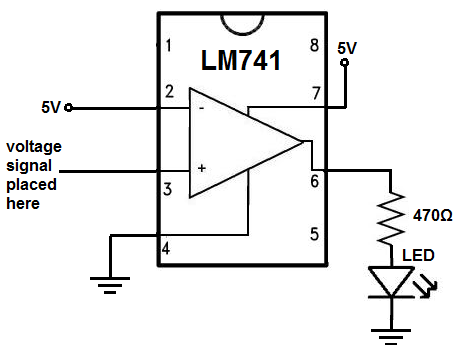 The main circuit schematic of voltage sensor using LM741 shown look like Figure 1. The main component in this project is LM741 IC. In this time we will show you one project of voltage sensor circuit schematic based on LM741. Beside circuit schematic shown, we also will give you global description about this project. Figure 1. Circuit schematic of voltage sensor using LM741. Circuit schematic like in Figure 1 above is voltage sensor using LM741. The main component used in this project is LM741. According learning about electronics site describe that reference voltage of 5V connected to the inverting terminal. This 5V forms our voltage threshold level. If the voltage at the noninverting terminal is less than 5V, then the output will be off or LOW. If the voltage at the noninverting terminal is greater than 5V, the output will be on or HIGH. To the noninverting terminal, we connect the test voltage signal we want to test. How the circuit works is very basic. If the voltage at the noninverting terminal is less, the LED is off. If it is greater, the LED turns on. This is how we form a voltage sensor circuit based on any voltage value. We can, of course, change the voltage anywhere from -15V to +15V. If you want to be able to constantly vary the voltage, you can place a potentiometer either at the inverting terminal or noninverting terminal or both and connect it to greater voltage to get a greater varying range. But this is how a basic voltage sensor can work. Eltronicschool. - This is one of the application of Internet of Things for any project such as for building air pollution mater with digital dashboard on smartphone using Blynk appication. The main component are used to build this project are temperature and humidity sensor DHT11, Arduino UNO with Ethernet shield, PM2.5/PM10 sensor (SDS011), and power supply. For the application (App) as the web server using Blynk. Blynk is an Internet of Things (IoT) platform to control Arduino, Raspberry Pi and the like over the Internet. In this project Blynk provides a digital dashboard on your smartphone that displays real-time air quality readings for the immediate surroundings. Blynk is not meant for a specific board or shield. It will get you online and ready for the IoT, irrespective of whether Arduino or Raspberry Pi is linked to the Internet over Wi-Fi, Ethernet or an ESP8266 chip. In this project, we will show you about the circuit schematic of the IoT enabled air pollution meter with digital dashboard, main component used, and the global description about this project. Circuit schematic like in Figure 1 above is the IoT enabled air pollution meter with digital dashboard. Electronicsforu site describe that Heart of the circuit is Arduino Uno board with Arduino shield. Other components used are voltage regulators 7805 (IC1 and IC2), temperature and humidity module DHT11 connected to connector CON3, gas sensor MQ135 connected to connector CON2, PM2.5/PM10 sensor connected to connector CON1 and a few others. Particle pollution, also called particulate matter (or PM), is a mixture of solid particles and liquid droplets floating in the air. Some particles are released directly from a specific source, while others are formed in complicated chemical reactions in the atmosphere. The PM2.5/PM10 sensor connected across CON1 was developed by INOVAFIT, which is a spin-off from University of Jinan, China. It uses the principle of laser scattering in the air, and can detect suspended particulate matter concentration ranging from 0.3 to 10 microns. Data collected by the sensor is stable and reliable. SDS011 sensor is connected to UART port (TX and RX) of Arduino Uno board. Sensitive material of the sensor is tin-dioxide, whose conductivity increases with the concentration of gas. Change in conductivity is converted into output voltage signal, which varies corresponding to the concentration of combustible gas. MQ135 is highly sensitive to ammonia, sulphide and benzene steams, smoke and other harmful gases. It is a low-cost sensor, suitable for different applications. Output of the gas sensor is connected to analogue input pin A3 of Arduino Uno board through connector CON2. This composite sensor contains calibrated digital signal outputs of temperature and humidity. Connected to connector CON3, it includes a resistive-type humidity measurement component and an NTC temperature-measurement device. Its output pin is connected to digital pin 5 of Arduino Uno board. It is a relatively inexpensive sensor for its performance.